If you are trading or investing, you need to make sure that you are making sound choices that are profitable. In order to do that, traders and investors need to make informed decisions. They often use either technical analysis or fundamental analysis to help them determine how to make these decisions. Is the company experiencing revenue growth? Is the company in a position to be able to pay its debts? Will the company prevail over the competition? Is the business running on the up-and-up? There indicators that their financial data may be fraudulent? Those are just some of the questions and factors that are considered in fundamental analysis. But there is only one question that needs to be answered – is it worth it to invest in this stock? What are the fundamentals that get analysed? It depends but anything that ties into how the company performs and what it’s worth is can be considered to be a fundamental and worthy of being analysed. There are more factors than simply profits, revenues, assets, management quality, and the company’s market share. The quality of their product. Quantitative factors are those factors that have to do with quantity or size. They are factors that have a numerical or measurable value. Fundamental analysis is based on the assumption that a stock’s actual value is NOT accurately reflected by its price. The value of the stock is referred to as the intrinsic value. It is assumed that the stock market will revert to the intrinsic value in the long-run. So by analysing the fundamentals investors can determine the intrinsic value of the company and its stock. If it is undervalued in the stock market they can invest believing that in the long-run their investment will be profitable. Financial statement analysis is a big factor in fundamental analysis. This is because it is how the company’s financial performance can be gauged. Financial statements are the primary source for the quantitative factors of a company. The Balance Sheet – this is like a snapshot of the company’s equity, liabilities, and assets at a given point of time. The Income Statement – this is how the company’s performance can be measured over a period of time. The period of time is specified on the income statement and is usually annually or quarterly. Statement of Cash Flows – information from the statement of cash flows includes the cash from investing, the operating cash flow, and the cash from financing. Financial statements are found in the quarterly 10-Q filings and the annual 10-k fillings. These are easily found online because all publically traded companies are required by law to submit their balance sheets, income statements, and statements of cash flows. Financial statements are analysed using ratio information. Depending on what information a trader or investor is looking for, depends on the ratio that they use. Investing in a company that you have no knowledge of is never a good idea. Fundamental analysis is a way to determine more about the company and what its theoretical value is. 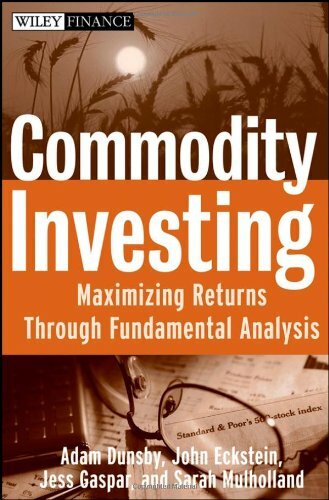 Fundamental analysis is also applied to valuing commodities. This is similar in principle, but different in how it is undertaken. The two main assessments are of the commodities supply and demand. Supply estimates the production of the crop etc. and demand estimates how much of it the market will be wanting to purchase once it is grown.